Why Are My Back Tires Cupping? /Tire care and maintenance​​ /Tire Safety /Why Are My Back Tires Cupping? What Is Back Tires Cupping? Tire cupping is an uneven wear pattern, which occurs due to irregular up-and-down motions of a wheel (bouncing). It interferes with the proper contact of the tire with the road, scooping rubber in spots. Also called tire scalloping, this form of treadwear appears in dips all over a tire’s tread edge. The worn bits are usually 3-4 inches in diameter. The cupped tire may cause a rumbling noise when driving at higher speeds. Your ride may also be quite harsh at slower speeds, due to this issue. Shock absorbers and suspension are responsible for a smooth ride. If any of them wear out or bend, tires absorb the bumps. As the bouncing movement occurs due to partial absorber/suspension failure, some spots of the tire experience extra friction, which causes cupping. It’s critical to check whether any of the parts are close to a total wear-out. However, according to a survey by one of the most influential shock manufacturers, only 21% of people find them important for ride control. Shock absorbers have a lifespan of 50,000-60,000 miles, while struts can work for 60,000-90,000 miles. So, to avoid back tires cupping and other issues, make sure you run a full diagnosis and replace them when the time comes. These elements are more important than one might think. The Cologne Institute for Traffic Safety in Switzerland conducted a test, proving the importance of shock absorbers. They found when this element’s dampening ability falls to 50%, the braking distance increases by 23%. 21 ft at 31 mph is an adequate distance to show how valuable these parts are, aside from keeping the ride comfortable. 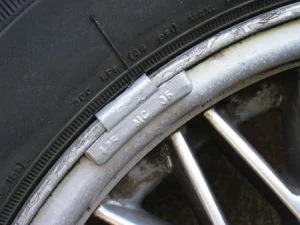 NOTE: If you don’t find the cause of your back tires cupping in the shock absorbers or suspension, check other elements connecting the wheel to the vehicle. Ball joints, springs, bushings, or even wheel bearings, may also be the cause. Wheel alignment is a three-setting process, which ensures your wheels are parallel to each other and perpendicular to the road. Camber is the angle responsible for perfectly vertical alignment of the wheels to the surface. When they are perpendicular to the road, the camber setting is 0. If it’s positive or negative, suspension parts may wear out prematurely. Toe is the angle between the wheels responsible for them being parallel to each other. This setting is the most important for even wear, as if it’s in or out, rubber will scrub off the tires, causing back tire cupping. Toe misalignment of only 0.17 inches drags the tire to the sides for about 68 miles per year. Caster is the angle between the steering axis and the road. The angle has to be 0 to ensure safe driving and no uneven wear. If the setting is positive or negative, the vehicle will become difficult to turn and its straight-line stability will suffer. If even one setting is slightly out of alignment on the rear wheels of a front-wheel drive car, the tread will cup. Back tire cupping also occurs when the front and rear tires aren’t parallel to each other, or if the toe angles are misaligned. In this case, wear will be diagonal around the whole tread. You should check wheel alignment every time new tires or suspension components are installed. In fact, a routine check should be done every six months, or at least once a year (12,000 miles). Correct alignment may be compromised when you hit a pothole or curb, so if you experience anything like this be sure to check the alignment. Vehicle pulling to one side while driving. Tire imbalance is uneven weight distribution across the tire itself. Although manufacturers use sophisticated technology and professionals to create their tires, some spots on them may still be stiffer than others. These spots cause an imbalance when the tire is mounted. When a tire is out of balance and you are driving at speeds of 45 mph or higher, it causes vibration and bouncing. Eventually, your tires may start to cup in an irregular pattern. This type of wear is also called patch wear. You can have a technician balance your tires when mounting them on the vehicle, by putting small weights opposite the stiff spots. However, as the tread wears, weight distribution changes, causing imbalance again. As even a 0.25-ounce imbalance may cause back tire cupping and other problems, so you should check your tire balance every 3,000-6,000 miles. Balancing your tires can improve tire life by as much as 15-20%, by preventing uneven wear. You can learn more about tire balance from this article. Tire runout is a flaw meaning it’s no longer in a perfectly round shape. The term can be used when referring to the wheel or rim too. Runout can be lateral (side-to-side imperfection and wobbling) or radial (the difference between the high spot and the average line, or low spot, of the rim). Some runout is normal for tire-wheel assembly, but if radial reaches .060 inches or lateral reaches .080 inches, shaking and wobbling may occur. 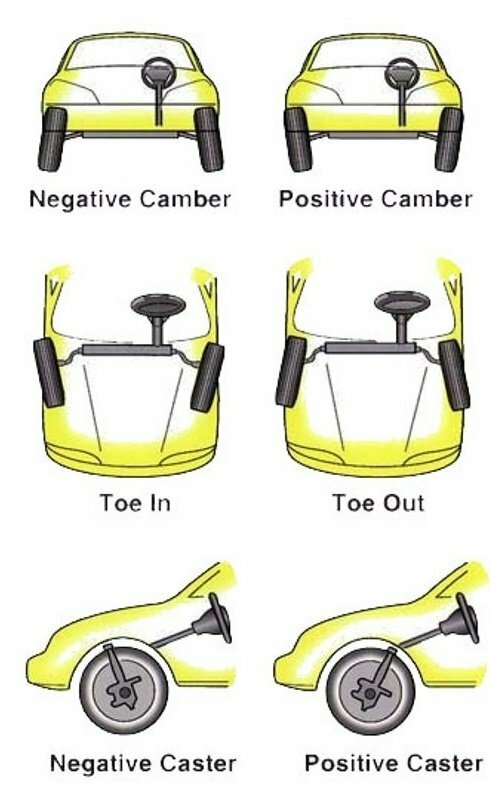 Any of these may cause back tire cupping, so if you notice these symptoms, go to a technician to see if the issue can be solved. Inexpensive tires of poor quality may be the reason for many issues, including back tire cupping. Such tires don’t have the right compounds to provide you with the performance of a regular tire. They are thinner, have less tread, may be severely imbalanced, or misshapen. In hotter states, such tires may start to dry out and chunk earlier, causing more serious problems than just vibration or uneven wear. That’s why it’s crucial you choose your tires carefully, ensuring you are considering all the important details. Is it Possible to Repair Back Tire Cupping? You can diagnose and repair the cause, but not the wear itself. If cupping isn’t severe, treadwear will even out after you rotate the tires. However, if the case is severe, you may need to replace the tire. Park the vehicle and put it on the emergency brake. Find the cupped tire by looking at the tread of all four tires. Push on the vehicle and see how much it bounces, and if it does considerably, the shocker absorbers are most likely the main issue. Aside from the rear tires, look at the front ones. 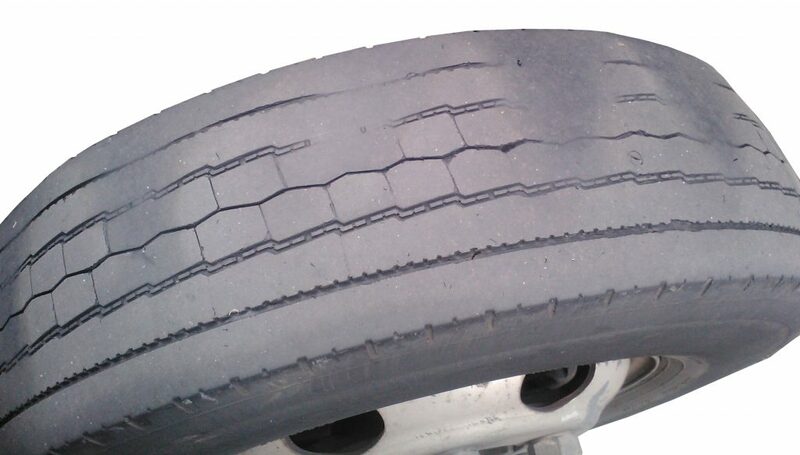 If there is cupping on the inside of the tread, wheel misalignment may be the cause. NOTE: It’s best that you go to a qualified mechanic to find the exact issue and repair it. The best you can do after diagnosing the vehicle yourself is go to a tire shop to fix the issue. A technician can fix or change the shock absorbers or suspension parts responsible for the back tire cupping. You may also need to switch to wider tires and rims, as they have more contact patch area, which will make your wheel more stable. Also, consider buying unidirectional tires, if not otherwise specified by your car manufacturer. Such tires will provide the best handling and traction. Under-inflation and over-inflation can cause cupping, as well as many other issues. Make sure none of your tires lose air more than the others and check their pressure every week. Rotation every 5,000-8,000 miles will prevent tire-related causes of back tire cupping, plus other types of uneven wear. Buy new tires in time. Find out how often you should buy new tires and don’t wait until they are of bad quality. At a tread depth of 4/32’’ or less, tires are more vulnerable to damage and can weaken suspension, which will then cause cupping. Driving while neglecting any present damage is dangerous, especially when the damage causes bouncing and vibration. The vehicle becomes less stable and will not tolerate any excess load or speed as much as it would normally. The tire may wear out prematurely, exposing its steel cords and belts. As a result, it may go flat or blow out, which is a difficult situation to drive out of. 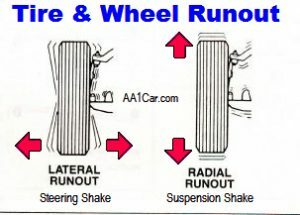 Back tires cupping also damages suspension, so even if it wasn’t the initial cause, it may wear out and break sooner. Such tires lose traction due to continual bouncing motions, which may result in an accident. Braking and cornering may become almost impossible due to the damage, which also may cause a crash. So, it’s critical you check your tires, wheels, suspension, shock absorbers, etc., every several thousand miles. Also, if you notice any unusual tilt or vibration while driving, make sure to go to a mechanic to find and fix the issue.